Within its 2011 agenda, the MTA promised to bring real-time bus tracking to every single bus under its purview on Staten Island. For those who have been charting the MTA’s bus-tracking project, this is a seemingly bold promise to put to paper. After fits and starts due to GPS compatibility issues, the authority had managed to install Clever Devices’ costly Bus Tracker program on only the M34 and M16, but the costs for that project proved too great for city-wide adoption. And so the MTA turned in-house for a solution. This week, Transit will unveil that in-house solution, as the agency’s bus time tracking system will be live on the B63 in Brooklyn. The new system will follow buses as they run from Pier 6 at the Brooklyn Bridge Park to the southern terminal near the Verrazano Bridge and back. 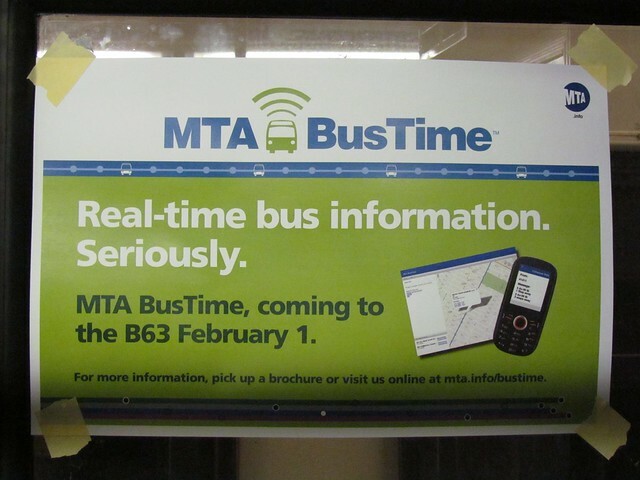 While the signs in the buses say the debut will be today, the official launch is still a few days away, and when the project is ready, it will be live on the MTA’s website at http://bustime.mta.info/. Last week, I took a tour of a bus at the Jackie Gleason depot with Michael Frumin, a senior strategic analyst with the MTA. Frumin, known for, among other things, his subway spark lines, has been working to develop an open-design approach to real-time tracking that comes at a lower cost than the Clever Devices’ implementation and allows the MTA more freedom with its data. He and I had a talk about the new bus tracking equipment and the MTA’s thinking behind an open source approach. The main problems with the Clever Devices’ system concern its proprietary nature and its cost. 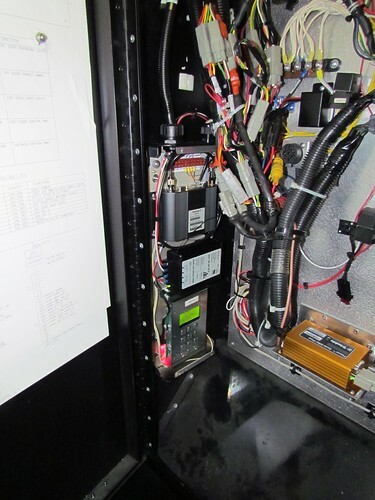 For the MTA to install Clever Devices’ computer, it must either upgrade old buses as a relatively high cost and maintain a closed computer network. At one point, the authority had estimated that it would take at least $140 million and five years just to install Clever Devices’ system through the city, and even then, the software and hardware handcuff the agency. Only Clever Devices can run software on its own hardware, and only Clever Devices can control the data flow. We’ve seen the limitations of the MetroCard technology, and the MTA wasn’t keen on pursuing a lengthy and expensive contract with another proprietary company. So the MTA instead went the open-source route. Working with OpenPlans, the non-profit behind Streetsblog, on a $265,000 software-development contract, the MTA went about setting up its own system. On the hardware side, the set-up is simple. Using much of the same technology that will one day be installed as card readers for the next-generation fare payment technology system, the bus tracking uses a wireless moden, a power conditioner, a highly-secure on-board computer and a GPS device with dead reckoning to track the bus. At the outset, the device relies on the driver to input data that he must input at the start of every route and when the bus turns around. By hooking the computer up to the bus route sign, the bus’ initial direction is sent to the software. For example, when a B63 leaves the Jackie Gleason Bus Depot and the driver arrives in Ft. Hamilton, he’ll set the sign to say that the B63 is Cobble Hill-bound. The internal computer will read the direction, and with data from the GPS, it can calculate the direction and location of the bus as it travels its route. The Clever Devices’ system relies on schedule data and other complex calculations to derive location. Of course, as with any less expensive and open system, the data won’t be as complete as that offered by Clever Devices. With its in-house bus tracker, the MTA can present at the outset how far away the bus is from its location but not how many minutes away from a certain stop the bus will be. Frumin told me that it is a goal to develop an accurate prediction algorithm for travel times. Meanwhile, because this new system is open-source, the MTA can open it up to developers. It will issue an API and allow New York’s myriad transit programmers to take a crack at the data. Frumin spoke to me about possible uses. Someone could develop an SMS alert system or a do-it-yourself countdown clock that auto-refreshes based on the BusTime information. CEMUSA, the owner of the bus stops, could, for instance, install its own timers even as the data remains available online. Essentially, with this open source approach, when you need to add features or want to borrow what others are doing, it’s quite easy. A screenshot of the B63 BusTime tracker as it will appear online. At press time, a larger image was not yet available. So what’s next? It seems clear that while the internally developed BusTime will make its debut in Brooklyn, Staten Island will be the real testing ground. Can an entire borough’s bus fleet be viewed at one time? Will the MTA run into GPS-based problems as it eyes Manhattan? Dead reckoning should fix that problem, but it’s much easier to implement location-based technology along 5th Ave. in Brooklyn than along 5th Ave. in Manhattan. For now, though, we’ll see in-house development in action. The MTA will have the chance to show us that it can develop real-time tracking for cheaper than a closed-source market leader. For a giant transit provider seemingly afraid of technology five years ago, that is a step in the right direction. As a tech geek I was hoping for an even simpler and less proprietary solution like a GPS enabled Android based smart phone that texts it’s location every minute or some such. But at ~$300k that’s not bad at all. By opening the API to developers, the MTA is making it possible for someone to build smartphone apps that let you do things like track buses, get alerts about arrival times, etc. I’m talking about the system onboard buses, not the API access the data which the GPS system generates. Has the City approached the MTA or vice versa? But more than likely, either or both sides don’t want to fight over who is responsible for the network underground. I’m not sure I’m clear on the point about the open data. The CTA uses the Clever Devices system for its wildly popular Bus Tracker service and it also has a public API for developers (http://www.transitchicago.com/.....acker.aspx). That’s why we have awesome mobile apps like Buster, and stores/cafés that have installed DIY Bus Tracker displays in their establishments. The software is open-source software that allows the MTA and other nationwide transit agencies to work to improve the code and its offerings. The costs of maintaining and upgrading are significantly lower than using Clever Devices’ proprietary system. It’s the same open source vs. closed system debate anywhere. It boils down to cost and flexibility. Ok, but that’s not what was written. It said developers would have a chance to “take a crack at the data,” not the source code. There are two parts to this, there’s the system onboard, and the API which makes the resulting data accessible. Both are open-source, but the MTA has hired a firm to develop the on-board system using an open-source solution, and the API will be made public so that John Q. Programmer can access the data and do something nifty with it. is about the resulting data, but both parts are still open-source. This rocks. Was this one of Walder’s initiatives? If so, it’s one of the best moves yet by the MTA. Open-source is good for everyone. What happens if the headsign malfunctions or if the driver doesn’t change the bus destination? And will the system account for detours? I have yet to program, but the in-house system seems fair enough. The biggest gap with the in-house system is there is no time arrival prediction. But it’s a shame they had to rebuke Clever Devices, a company in the MTA’s backyard (based in Plainview, Long Island). And what happens to the Clever Devices system on M16/M34 buses? There were a couple of ladies doing surveys on the B63 last Saturday night, this had to be part of the reason. I didn’t fill one out because I said I wasn’t a regular rider of that bus. I do understand the concern about proprietary software and costs but what is Windows then. Clever Devices does provide a good system and its been proven to be good for Chicago. Also, I think they have some open architecture and protocols somewhere. I just think MTA and Clever still won’t develop a good relationship after the failed experiment in the early 2000s. Plus, isn’t it about time NYC had automated announcements. NYC is the only major city that does not have some sort of automated announcement system for their buses. Toronto had did things in house but I don’t think they considered open source protocols. Somehow, I feel like for what they are trying to accomplish, it feels better to go for something proven than having to put all the pieces together and hoping things work. The best thing NYC can do is distance it self from Clever Devcies and some of their good old boy style of doing business. Several Agencies mention that the Clever Devices are not operating as promised. Just look at their collision avoidance system (bad news, over prices). What a huge boon doggle. I like the fact that the MTA as well as many other agencies are going in a direction away from Clever Devcie Products.